When I first got my makerbot I couldn’t figure out where to put it. Finally I settled on the spot above my tool chest, It’s the perfect height, perfect size and it sits in a spot thats well ventilated (although ventilation is not really an issue when printing the PLA filament with the replicator 2). I found that the filament kept getting stuck /binding and I would end up with a partially printed file. It also made it pain to change out the filament, because it was in the corner. 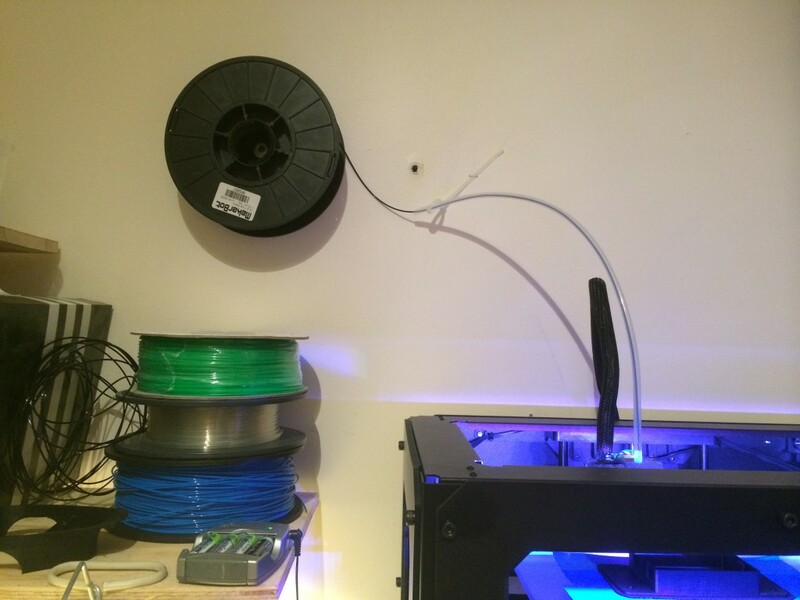 I ended up printing out a modified version of this spool I adding a hole in Rhino and removed the tab, then mounted it to the wall. The result lets me quickly swap out filament without disturbing the machine. Feast your eyes ….